Arsenal goalkeeper Petr Cech is used to winning trophies on the football field - but says his favourite ice hockey team landing a major honour would be a huge moment for him. Cech arrived in the UK in 2004 when he signed for Chelsea and during that time has found another team to support on English shores. The Czech Republic international is a big fan of ice hockey and, on Sunday at 16:00 GMT, his adopted team Guildford Flames are set to take on league challengers Belfast Giants in the Challenge Cup final. Unfortunately for Cech, work commitments will prevent him from going to the Welsh capital on Sunday, as Arsenal start their Premier League match against Manchester United 30 minutes later. But he will keep an eye out through other means. 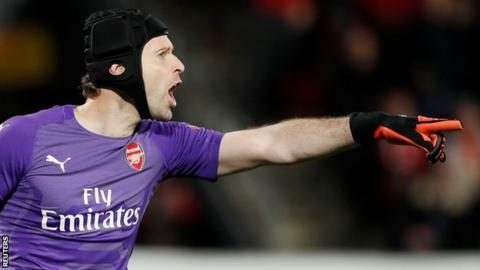 Cech said: "I was planning to go to Cardiff and to be there in this historic moment for the club and for the team, but we've got a crucial game on Sunday. "At the very least, I'll be trying to stay updated with the game as much as I can and hoping the Flames can do it." And he believes a victory for Paul Dixon's side at the Viola Arena in Cardiff, in a game in which they are the underdogs, would be a huge achievement. "It would be an amazing story if Guildford, having gone so far to the final, win it. It would be absolutely brilliant," Cech said. "I think you can tell by the reaction of everybody when you go with people to the game since the semi-final, everybody has been talking about the final. It makes you realise how big an occasion it actually is for the fans and for the club. "I've enjoyed watching the Flames a lot, especially after the last season when they came in as a rookie team and did well in finishing sixth and reached the play-offs. "They always say you can only be as good as you can be in your first season, but your second season shows how strong you actually are and the team becomes. "So this season, they've made it to the Challenge Cup final and are still in a great position for the play-offs, so it's great to see the Flames take it step by step and constantly improving." Cech's first experience came when a friend decided to take him along to the club's Spectrum rink when they were still a formidable force in the now defunct English Premier League. Flames, in their 27-year history, were one of the most successful teams at that level until they decided to take a leap and join the top-flight Elite League two years ago. They have more than held their own, having already won the Patton Conference this season, and are hoping to add the Challenge Cup on Sunday by beating the Giants. Cech spoke about his initial experience that led to a friendship with the players and coaches at the club. He added: "I started following the Flames when they were in the EPL. I went to a game where they played Manchester Phoenix and it was a top-of-the-table clash. "It was my friend's idea to take me so I went and we saw Milos Melicherik, who was a player at the time and is now the assistant coach, and he asked me to be in a photo with the team. "We had a friendly chat and he invited me to any training session or game whenever I wanted to and just to let him know. From there, I was following the team. "I've skated with the boys when I can to keep myself fit and to improve my reflexes and that's something I enjoy a lot as well." And how does Cech think Sunday's final will go? "Belfast are the team that have been top of the table and are the favourites to win, and this is something I think can help," said the 36-year-old. "You don't go to the final as a favourite, you go as an underdog and the Flames are going into their first ever final. "They can go with the spirit of doing it against the odds, which can sometimes help and I think everybody will be pumped up and ready to go."